This year’s Lent course was called ‘Finding a voice’ and was based on the film ‘The King’s Speech’. Each week we watched extracts from the film, which we discussed with the aid of a course booklet. 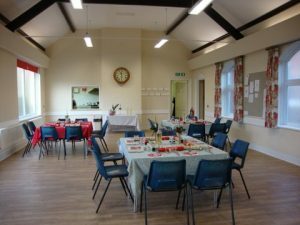 Our Cafe Services are held from time to time in the early evening in the Cafe at the back of the church. Please refer to the Upcoming Services for details. For all baptisms, weddings, funerals or thanksgiving ceremonies, please contact our Minister, Rev’d Richard A. J. Grocott on 020 8857 1281 and he will advise you on all you would like to know about the ceremony and anything else related to it. To view the premises, please contact our lettings officer, Jackie, on 07866 962032 or email jackieingram99@gmail.com. 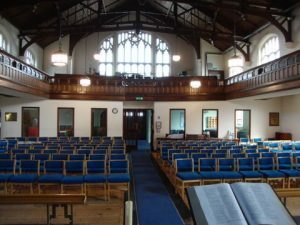 Eltham Park Methodist Church is a fine Edwardian building, with the original beamed roof and leaded windows, and an encircling balcony. It is in good repair and has modern lighting, heating, and comfortable seats. 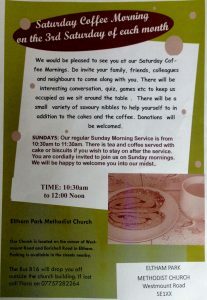 We like to welcome people from Eltham and round about to celebrate their important days such as baptisms and weddings in our much-loved church. Sadder occasions such as funerals are also part of what our church sees as being an important contribution to the life of our community. Services are usually conducted by our own minister, and we have an organist who can be booked for your service.